Between the sixteenth and eighteenth centuries, pirates from the Barbary Coast of North Africa harassed the shipping and coastal villages particularly of Spain and Italy, but also of Devon and Cornwall, in search of plunder, both material and human. 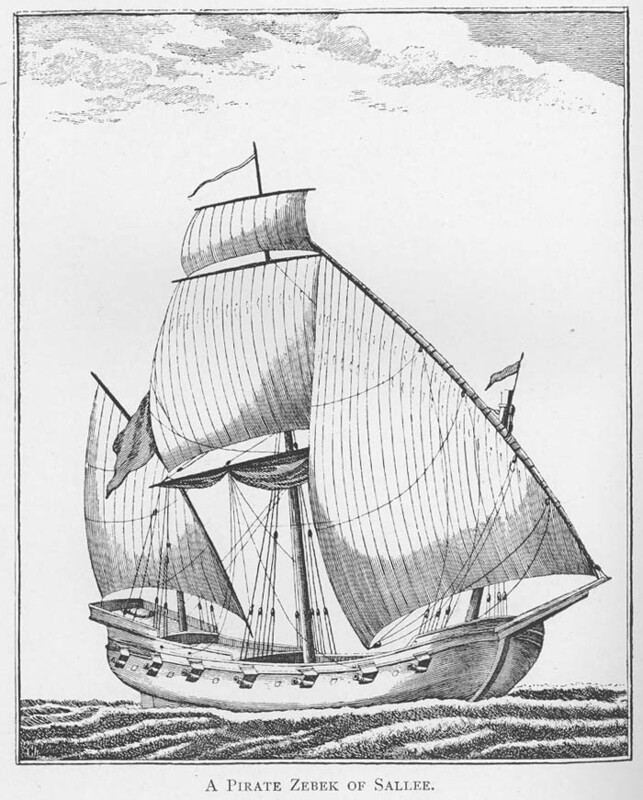 Thomas Pellow of Penryn was of a similar age in 1715 when his ship was seized by Moroccan corsairs. Attacked by a British Man of War, their ship ran aground near the port of Sallee, drowning some of the captives. Pellow himself was rescued and taken ashore to begin a life of slavery. The story of Thomas Troughton, was reproduced some 40 years later by an Exeter man who sailed with him in 1746. Their ship, The Inspector, was itself a ‘privateer’, an officially sanctioned pirate ship, which seized French vessels and took them as “prizes” to Lisbon or Gibraltar. When they ran aground near Tangier, the crew expected assistance as “the Emperor of Morocco was at that time under a treaty of peace with the British Court”. Instead they “received the mortifying news that…a state of slavery would be our portion until the British Government had discharged an old debt claimed by the Emperor.” Their officers escaped, leaving the rest of the crew to their fate. Some of the slaves, including Pellow and Troughton were delivered to the Emperor, and became his personal property. Captives of high rank were of particular value. On hearing that officers had escaped, the Emperor personally began the beheading of 334 people held responsible. A ransom value was an incentive to preserve the life and health of certain slaves, but most could expect only hard labour and regular beatings. Some were used as galley slaves, others in heavy building work. Conversion to Islam was one route to better treatment. For many, including Pitts, this was an agonising decision since it was widely believed that it would bring eternal damnation. Indeed, his father, in a letter, seemed more concerned about Pitts’ religion than his freedom. Finding a ship from Topsham in the port of Algier, he met a man from Lympston who agreed to smuggle a reply, assuring his father that he remained “a Christian at heart”. Pellow’s conversion was made under some duress, but he seems to have been less troubled by religious scruples. After four years of negotiations, the surviving crew of The Inspector, including Troughton and his friend from Exeter, but excluding the 28 who had converted to Islam, were eventually released on payment of a ransom. Pellow spent 23 years in the service of the Moroccan Emperor, during which time he married and fathered a child. Only after the death of his wife and daughter did he also decide to escape and return to Penryn.